AFAN ATHANOR: Is this the Art world we really want? Is this the Art world we really want? When I saw the cover art of the new Roger Waters album "Is this the life we really want?" I was absolutely sure it was credited to or at least inspired by Emilio Isgrò, a famous conceptual artist who started developing his "cancelation" concept since the early '60, long before Syd Barrett founded Pink Floyd. Instead, it seems Waters was unaware of him or maybe his creative staff forgot to acknowledge him in the album credits. Isgrò has been able to report the plagiarism few days after the official release date and to stop the album distribution in Italy mainly thanks to the fact he's a world-wide renowned artist represented by several galleries around the globe. 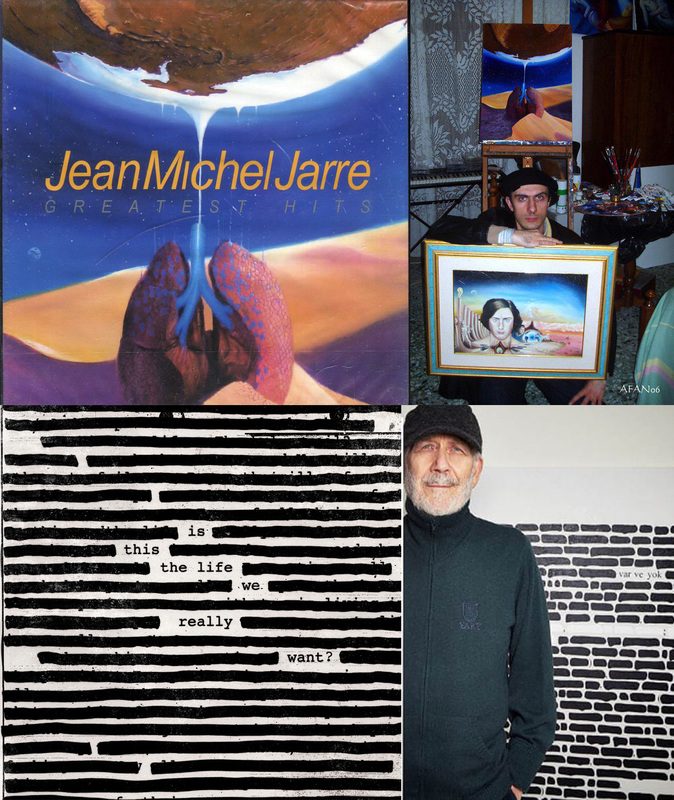 However, I think my case is even worse: in 2008 the image of an oil painting I created and released on the web in 2006 for the 30th anniversary of Jean-Michel Jarre album "Oxygene" has been "stolen" by an illegal Russian label called "Star Mark" to be printed without my name as the cover art of an unoffficial greatest hits that's still on sale on many music stores. So far, I haven't been able to denounce them since the label hasn't an official address and no one suppported me in reporting this case of intellectual property right abuse. Jarre himself, who's the president of CISAC , the International Confederation of Societies of Authors and Composers, hasn't stated anything yet about this case directly linked to his music (last year I've even managed to personally give him my artbook containing that painting). My artwork has been released for the first time on line in 2006 by the webmaster Duncan Walls on the JarreUk website as a tribute to the 30th anniversary of Jarre's "Oxygene" album and the "Water for life" concert held by Jarre in December amidst the dunes of the Sahara desert at Merzouga, Morocco . The original artwork has been exhibited for the first time at the London Brick Lane gallery during October 2007. It has been included in my first color artbook "The Sinovial Gaze - The art of Alessandro Fantini" released in 2008. Isgrò didn't need the support of CISAC as he's already wealthy and famous enough to sue anyone attempting to damage his intellectual property. His case can be considered the tragic proof that if you're a talented young artist (looking for being credited as such) but unable to pay lawyers or without influential friends you're doomed to be (metaphorically) raped and mocked by the commercial system. How can I encourage emerging artists to post their works on the web if someone like me, after releasing a sheer amount of artworks, books, videos and music is still struggling to be protected and treated with respect?